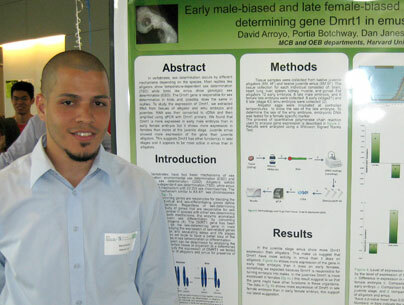 In Summer 2009, 12 undergraduate students from diverse colleges and universities spent eight to ten weeks conducting research in the Molecules, Cells and Organisms (MCO) Program, an interdepartmental Ph.D. training program comprised of faculty from the departments of Molecular and Cellular Biology (MCB), Organismic and Evolutionary Biology (OEB), Chemistry and Chemical Biology, and Stem Cell and Regenerative Biology, and members of the members of the FAS Center for Systems Biology, the Center for Brain Science, the Microbial Science Initiative, and the Harvard Stem Cell Institute. The students were participating in several undergraduate summer research internship programs organized by MCO, FAS Center Systems Biology , the Leadership Alliance Summer Internship, and the Exceptional Research Opportunities Programs (EXROP). These internship programs aim to recruit students from underrepresented groups without a strong presence in science, including minorities and students from educationally or economically disadvantaged backgrounds. Many of these students have never considered applying to an elite institution or pursuing a Ph.D. program or a career in research. “We realized we really need to reach out to these students and show them that Harvard can be an extraordinary place for them to do research, and also very enjoyable. It’s been a real joy to interact with these students,” says Catherine Dulac, Higgins Professor of Molecular and Cellular Biology, Howard Hughes Medical Institute Investigator, and Chair of MCB. Dulac, who has hosted one or two interns each summer, is convinced the programs are helping many students decide to pursue a career in research. However, it is not always easy to attract students from underrepresented groups to Harvard research internships, the organizers concede. Becoming a physician often defines the standard of success in their community, and many students do not realize that science, not just medicine, also makes important contributions to society. He was also simply not aware of the joy of research because most undergraduate courses do not include inquiry-based research projects. “Undergraduates rarely see how scientists design the actual experiments that lead to the conclusions that make it into text books,” explains Professor Cassandra Extavour, Assistant Professor of Organismic and Evolutionary Biology, who hosted Omar Delannoy from Puerto Rico in her lab in the MCO program this summer. Perez was entering his senior year when he did his internship, but most of the summer students are rising sophomores or juniors. “Most internship programs don’t take rising sophomores because they have had so little experience with labs and coursework. But we find that the younger students do just as well in the program, and we really enjoy working with them,” says Stern. Each summer intern has an individually defined project – from molecular biology to evolutionary biology to computation, from purely theoretically to cells in a dish. Some interns contribute to an ongoing project and others work together on a larger project, and their research may appear in future publications. “I felt like I was knee deep in research, truly engaging work at the bench, and contributing to the research in the lab!” recalls Aakash Shah, a 2009 Systems Biology intern from Ursinus College who worked in the lab of Roy Kishony, Associate Professor of Systems Biology at Harvard Medical School. After his summer internship, however, Perez decided to stay on and continue researching at Harvard while finishing his undergraduate coursework by the Internet. During that year, he “fell in love” with neuroscience and is now a second year graduate student in Dulac’s lab, investigating how genes control behavior when organisms are stressed. The posters could not happen without peer mentors, Harvard graduate students who do not work with the interns in the lab but help them with everything from mundane details of Harvard life to the important poster presentation. To convince students that research can make an attractive career path, the programs immerse students in the broader academic and social environment. A seminar series introduces them to other Harvard faculty, and students begin to realize they can approach professors to talk not just about their own projects but about science questions in general. Students visit other academic and research institutions in the area – a favorite is a tour of the Broad Institute’s high throughput genome sequencing facility. The programs also host a session on how to apply to Ph.D. programs. Students live in Harvard dorms and do activities both on campus and in the greater Boston area. “Also, the lab becomes like a family,” says D’Souza, and a source of fun. The Exceptional Research Opportunities Programs (EXROP) summer undergraduate research internship was organized in 2003 as part of the HHMI effort to attract underrepresented groups to careers in scientific research. In 2007, FAS Systems Biology began a summer undergraduate research internship for underrepresented students from both Harvard and other institutions. In 2008, the Leadership Alliance, which is a consortium of 27 participating institutions, began a similar program at Harvard, and the recently formed Molecules, Cells and Organisms (MCO) Program began offering these summer internships in 2009.